Storm Rider MT Arcade Machine is an arcade motorcycle racing game in which players ride atop a motorcycle styled control, racing against each other, and the clock, for first place! Players can choose from ten unique bikes to race, across eleven tracks. The tracks are based in three major location sites: a Harbour, a Forest and the 'Old Flight Facility'. The cabinet features a modern style bike pedastal seat which controls the motions of the bike in-game, a 42" LCD monitor with HD graphics, and is linkable up to four players simultaneously! Players really get a sense of high speed with he fast paced game play and of accomplishment as well, as six of the eleven tracks and five of the ten bikes must be unlocked through achievements. The game also features a cool, unlimited boost system. 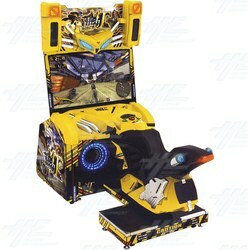 This bright cabinet stands out on any floor, while the thrilling gameplay will draw in players from all across the floor to try this high speed racing arcade game. Suitable for larger locations, such as Family Entertainment Centers. Storm Rider MT Arcade Machine is an arcade motorcycle racing game in which players ride atop a motorcycle styled control, racing against each other, and the clock, for first place! Players can choose from ten unique bikes to race, across eleven tracks. The tracks are based in three major location sites: a Harbour, a Forest and the 'Old Flight Facility'. The cabinet features a modern style bike pedastal seat which controls the motions of the bike in-game, a 42" LCD monitor with HD graphics, and is linkable up to four players simultaneously! Players really get a sense of high speed with he fast paced game play and of accomplishment as well, as six of the eleven tracks and five of the ten bikes must be unlocked through achievements. The game also features a cool, unlimited boost system. This bright cabinet stands out on any floor, while the thrilling gameplay will draw in players from all across the floor to try this high speed racing arcade game. Suitable for larger locations, such as Family Entertainment Centers. Linkable up to 4 players! 42" LCD screen with HD graphics! 11 tracks, 6 of which have to be unlocked! 10 bikes, 5 of which have to be unlocked!